The NRCS + MU Grasslands Project focuses on four main activities: Grazing plans, NRI (National Resources Inventory), native warm-season grass monitoring and soil health. The goal of these activities are to increase grassland sustainability in Missouri through research and technical assistance. For more information on these activities please contact your local member of the NRCS + MU Grasslands Team. 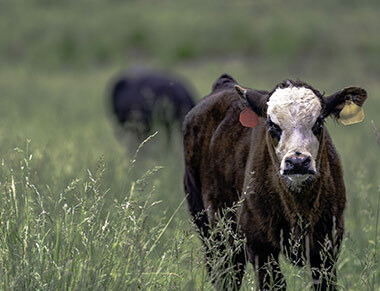 Technical assistance to landowners with grassland livestock concerns. Includes contact, consultation, on-site visits to assess and determine program eligibility, assistance with application, mapping, conservation plan development, toolkit applications and follow-up. Periodic assessment of the status and changing conditions of the soil, water and related resources on private land conducted by United States Department of Agriculture's Natural Resources Conservation Service in partnership with MU Extension. Establishing and monitoring sites where native warm-season grasses are in pasture rotations as well as data collection regarding soil health and erosion. Penetration resistance – a measure of the maximum soil penetration resistance (psi) (0” to 2”, and 0” to 6” inch depths), or compaction. Wet aggregate stability – a measure of how well soil aggregates resist disintegration when hit by rain drops. It is measured using a standardized simulated rainfall event on a sieve containing soil aggregates between 0.25 and 2.0 mm. The fraction of soil that remains on the sieve determines the percent aggregate stability. Total carbon – measurement of the carbon stored in soil organic matter. Active carbon – a measure of the small portion of the organic matter that can serve as an easily available food source for soil microbes, thus helping fuel and maintain a healthy soil food web. It is measured by quantifying potassium permanganate oxidation with a spectrophotometer.